Honor those who have battled or is battling Cancer when you and your whole family show support with our Cancer Awareness Hat. 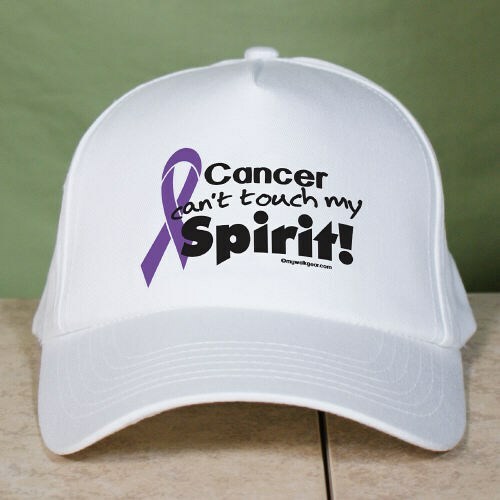 Our Purple Ribbon Cancer Hat is ideal for any cancer survivor, warrior and advocates because cancer awareness matters. Our Cancer Awareness Hat is perfect for spreading awareness. Our Awareness Hats are printed on our premium white cotton/poly Hat with adjustable back strap for a one size fits all. Additional Info Wear Cancer Awareness Apparel and Gear to show your support. Each Awareness Shirt or Gift is great for events or any time to support awareness of cancer. Be sure to also promote awareness with our Purple Hope Ribbon Sweatshirt and our Purple Hope Ribbon Key Chain.